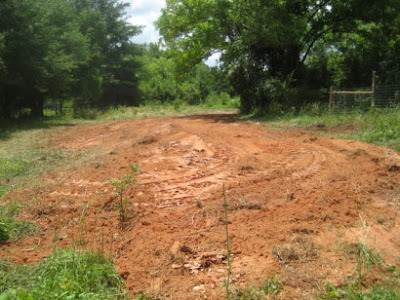 About a week or so ago I told you about our septic system problem (that here), i.e. that we discovered that we had no drainfield (leach field). Fortunately, the septic folks were able to get on it quickly. They came with their heavy duty equipment one day, and within a couple of hours had dug a massive trench. In constructing a leach field, the number, length, and depth of trenches are determined by several factors. These are spelled out in local building codes, but basically take in to consideration the type of soil, how quickly it absorbs water (known as soil percolation), and the depth of the water table. Because we had the land, ours is a huge long trench, starting at the septic tank near the back corner of the house and carport, and curving around to near the goat shed. If you take a look at field #1 on our master plan, you can probably visualize what I'm trying to describe. The next day perforated drainage pipe was installed and embedded in 3/4" stone. Then the trench was filled back in and packed down. It left a huge part of goat field bare. I reckon it's just as well I've only got two goats to start, because there's a whole lot less to browse on now. Of course, bare soil never stays bare for long and it won't take long before we won't even remember what this looked like. It's really too bad we aren't ready to sow something here. Someday perhaps. And a fine drainfield it is too! Hooray, it's done. Such a relief. I think it's a fine time to appreciate big machinery and not having to dig a trench like that by hand! Good to get it done and out of the way. Whew! 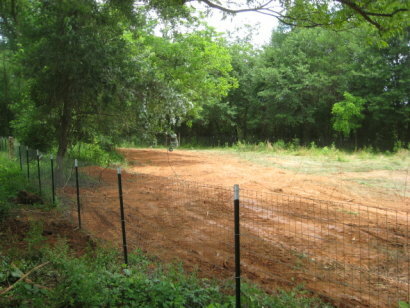 You must feel good to now know you have a good septic system, drain field and all. Kind of important to keep the ol' homestead operating smoothly! Good job. P.S. 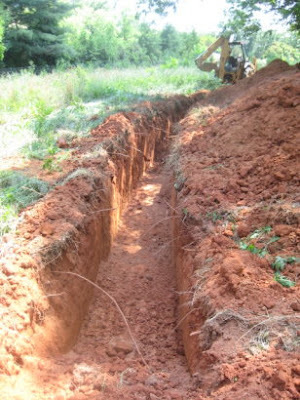 Hubby and I dug a trench like that (I have pictures to prove it) in which to lay water lines for the first home we built. We did it by hand in Illinois in hot, humid summer time. Dumb? Well, very lacking in finances anyway! With no drainage field, did you have to pump the tank out every so often? You can say that again Theresa. Not something we would have particularly chosen to do, but those kinds of necessities just come with home ownership. Nina, I agree. With every point you make! Mama Pea, I just feel fortunate we had the money to do it. Otherwise we would have been doing the same thing! Benita, we had it pumped as a matter of course, since we didn't know what the previous owners did (or didn't do.) I don't have a clue as to how they maintained it, especially since it's a small tank and they had a family of 5. Quite a puzzler, actually. Over here the only way to sell one's house is to have the (whole) septic system in place and functioning well (called Title V). Without Title V, you can't sell. Our previous owner had to have the whole system replaced when she sold it, and did they rip up the place! What a mess they made, moving topsoil to the bottom and subsoil to the top. I was very upset about it. We too didn't have time to immediately plant on the disturbed soil. We really should have. *Anything* would have been better than the jungle we got from Mother Nature! I advise you throw a bucket of vetch or some such, just to keep the soil working. I know the goat will make it hard to grow but... Well, maybe they'll keep the weeds down. That reminds me: can I borrow your goats? We've had our share of septic problems too. Fortunately they've slowed since the grass started growing and some changes were made to our habits. Wow, that went well and quickly too, I might add. The good news is this is the growing season, not the muddy season. Great timing! Goats are very helpful for that jungle! LivingOurWay, good point about living habits. We've lived with septic systems for a long time and have tried to develop a lifestyle to keep them healthy. The author of 5 Acres & Independence said they never had their tank pumped and never had a problem. I think that goes back to those life habits. Sharon, we were both relieved that it got done quickly. We're assuming no one noticed before because of the overgrowth over the whole thing. Then we come along and start clearing out some of the weedy shrubs and saplings. Unfortunately, we're having a deluge of spring rains (3.85" so far this week and it's only Wed morning! ), and praying it all doesn't wash down the hill! How wonderful that the job was done so quickly! I agree with the comment to throw some seed down. Anything, really. To try to prevent the soil from being baked into concrete as we come into the heat! Wow, talk about fast work. It's a nice feeling when things get done quick. Glad that it was done without any problems and so fast. 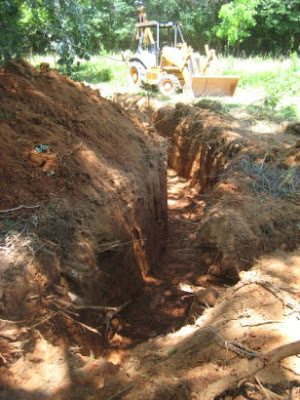 We have a septic system and the thought of it having to be dug up for some reason gives me chills. It is one of those things that must be done but so much mess and money too. Maggie, very true about being baked to cement-like. I thought about washing away with all the rain we've had so far this week, but it could bake barren as well. Robin, very much so. Especially with something like this. Leslie, fortunately it was only a drainfield that had to be dug. The septic tank itself is small, but still serviceable. Even though it's adequate for just the two of us, we still plan to put in a graywater system as soon as we're able.